Like most other launchers these days, the LG has integrated the phonebook and dialer in one interface. Tapping the dedicated Phone and Dialer shortcuts merely take you to different tabs of the Phone app. Selecting a contact displays the basic details: name and photo, numbers, emails and such. The dialer has smart dial, which searches for both digits and letters. You have the option of removing the Favorites and Groups tabs, leaving you just the Dial, Call logs, and Contacts interface. This is great for simplifying what is oftentimes a crowded interface. The smartphone packs a neat set of call-related tricks such as automatically silencing the ring of an incoming call just by putting the phone face down or automatically answering an incoming call by raising it to your ear. The quality of the loudspeaker is good, but it is being directed outward from the rear panel, rather than towards you from the front panel like on the HTC One, for example. The speaker's loudness is average and failed to beat its predecessor and the LG G3. 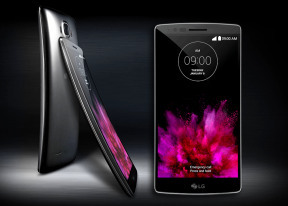 In addition to the usual SMS, MMS, email capabilities, the LG G Flex2 can also connect to Google contacts via either texts or video calls by use of the Hangouts app. SMS and MMS messages are displayed in threads - you see a list of all conversations, each listed with the contact's photo, name and the subject of the last message, as well as a part of the actual message. Tapping a conversation brings up the entire message history with that contact. LG lets you customize the look of the messaging app by assigning custom backgrounds and message bubbles. The G Flex2 comes with two email apps - the traditional Gmail app and the LG E-mail app. The latter has the added benefit of merging all your email accounts into a single interface with a unified inbox. LG offers a wide array of typing methods, including split keyboard, voice recognition, handwriting recognition, and Path input, LG's take on Swype. Even in portrait mode, the keys are amply-spaced on the 5.5-inch screen, and you have the added ability to raise and lower the keyboard to get more or less gaps between the keys. There's also a boatload of customization options, including a dark-toned keyboard, vibration when pressing a key, character bubbles on key press, to name a few. LG can even update its word suggestion library, if you have the option enabled.